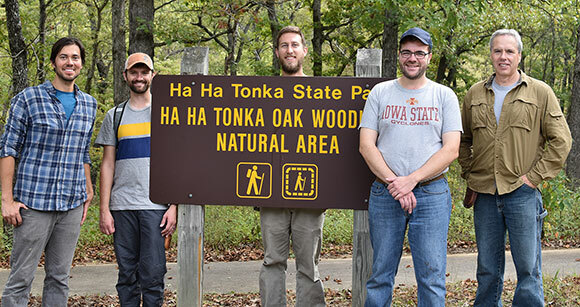 Why did five Midwestern horticulturists hike through the oak-hickory forests of the Missouri Ozarks? And why did we need a desiderata? The first question is easy—we were on the trail of specific wildflowers and woody plants to preserve and add to our collections. In a trip funded by the Plant Collecting Collaborative (PCC), a consortium of public gardens, Tom Weaver (horticulturist, Dwarf Conifer Garden) and I (senior horticulturist, Entrance Gardens) joined Kelly Norris (the trip leader) and Josh Schultes of the Greater Des Moines Botanical Garden, along with Steve McNamara of the Minnesota Landscape Arboretum. Before we left, our desiderata—or essential list of desirable plants we would target—was developed, based on what plants our gardens deemed important for conservation, to fill a gap in our collections, or add beauty to our display gardens. And of course, we had the proper state and federal permits in hand for seed collecting. The six areas that we explored were typically oak-hickory forests, which opened up to rocky-soiled glades and provided for plentiful opportunity for collecting wildflowers. 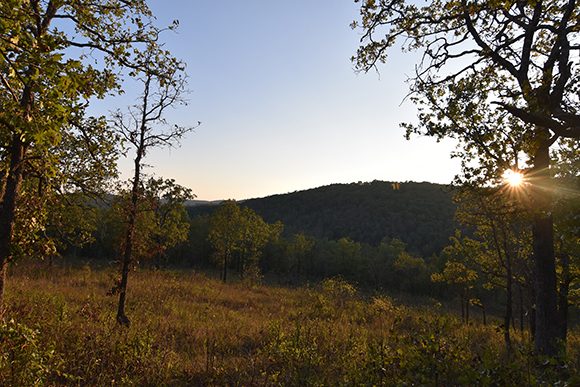 With an eye for distinct plant material and genetic diversity, we roamed through the uneven Ozarks terrain, but we weren’t tied to our wish list—we also found a couple of surprises. Since seed-grown plants are reproduced sexually through pollination, via wind or insects/animals, they are genetically variable. A variety of genes can give each plant the best chance to exhibit a specific phenotype, or physical appearance, and better adaptability to survive pests and diseases. Where seeds are collected could have significant implications on whether a plant can survive in a given environment or not. 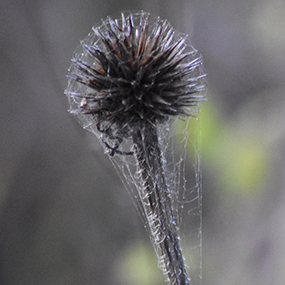 For instance, we collected seeds of Echinacea paradoxa (yellow coneflower) from its northern most growing region, in Ha Ha Tonka State Park in Missouri. Selecting seeds of Missouri provenance gives this wildflower a better chance of survival in our region, rather than if the seeds had been collected in Texas. Plants that have a different phenotype from what we commonly observe in northern Illinois were of special interest to us. 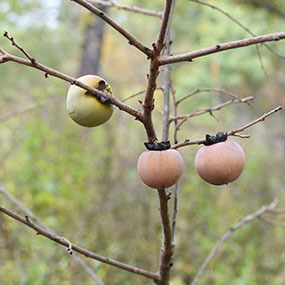 Fruit from Diospyros virginiana (common persimmon) was collected on a 4-foot-tall tree in Mark Twain National Forest because it is unusual to see fruit on a tree of such short stature. In a similar fashion, Symphoricarpos orbiculatus (coralberry), was collected from the Big Buffalo Creek Conservation Area, after we all remarked at the stunning ornamental quality of the fruit display. 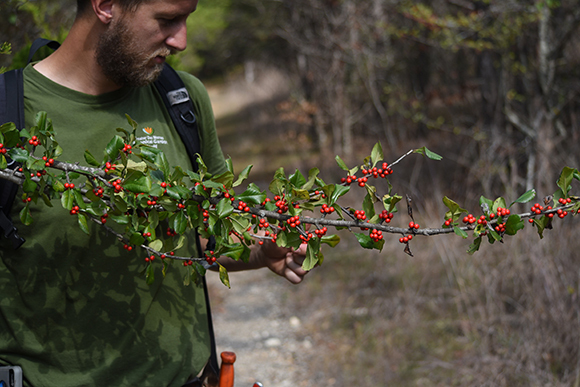 Josh Schultes examines possumhaw holly for collection. In some cases, we came across desirable plants, but they had already dropped their seed for the year, or simply didn’t produce any due to drought-induced stress. With the aid of GPS, we marked these areas so future explorers to the Ozarks are aware of these plants for their potential collections. For example, Boyce Tankersley, the Chicago Botanic Garden’s director of living plant documentation, was a part of a team that collected in many of these same areas in 2005; their field data was helpful in our search. Although the Ozarks region experienced a late-summer drought that negatively impacted seed production in some instances, we were still able to make 71 collections from October 12 to 16. Our seeds will be grown in our plant production greenhouses. Once they achieve a certain size, they will be distributed to PCC members and planted in the Garden. 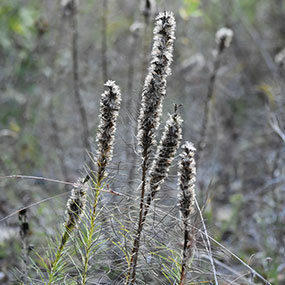 I am ecstatic to cross Liatris punctata (dotted blazingstar) off the desiderata for use in my gravel garden project in parking lot 1. The seeds we collected should be ready to plant in these beds in two years. It is fantastic to see of your adventures, Michael and Tom. Thank you both for the hard work you do to maintain crucial plant species that are important to the garden. See you guys around the garden! Happy Holidays! I love these emails that the Garden employees send! No matter what, whether I am interested in the particular topic or not, I read them, and I always, always find them interesting. They are a reminder of how much work goes into the Garden behind the scenes for every little seed, every little sprig, and every little burst of nature we patrons see each and every time we visit. Plus, I love knowing how passionate the Garden and the employees are about their craft. Thanks for all that you do!